Joy Chen can transform a business, even in midst of economic downturn. She joined Yes to Inc., after 17 years at Clorox, quadrupling the business revenue and increasing the valuation of the company five times. During her role as CEO of Yes to, Inc. the natural beauty brand was recognized as one of the Top 100 fastest growing companies in the SF Bay Area. Last year, after five years with the company, Chen left Yes to for H20+, a beauty brand that's been around since 1989. Chen is helping modernize the co. (it's now H20+ Beauty) grow its global presence, and remains ever-enthusiastic about the jump from startup to established brand. We checked in with CEO to get her take on innovation and playing it safe. Can you tell us a little bit about your background? You’ve worked with some major brands, you were a VP at Clorox, you’ve turned major companies around, but where did you get your start? I worked on many brands when I was at Clorox – from cat litter to cleaning products to bleach. Through this time, I worked on many brands including brand turnarounds where the brand was in trouble and had to revitalize it for growth. I realized that I was most challenged and excited when I was fixing a business problem like that. That’s why when I left Clorox, I was looking for a brand that I could turnaround to profitable growth. Was there a “grunt job” that you remember hating, but ended up taking away some major lessons that you’re now grateful for? I had to take a sales role at Clorox, but my career was in Marketing and my goal was to be a general manager someday. I saw the sales role as a setback to my career path. It turned out to be the best role I have ever taken because it set me up to be a better CEO. It taught me how to sell my ideas and influence others to come along with my vision. I met one of my mentors, who was then my boss. He taught me how to be successful in a male-dominated corporate world. Let’s chat about your current position as CEO of H20+. This is a brand that’s been around since 1989. How do you innovate and differentiate with a brand that’s almost 30? Innovation and differentiation are the lifelines for building brands. It does not matter how old a brand is, there is always a way to innovate because consumer needs always change. I worked on Clorox Bleach when it was around 80 years old and I launched concentrated improved bleach which ended up changing the entire bleach category. "Innovation and differentiation are the lifelines for building brands." At H2O+ Beauty, we took the DNA that made H2O+ successful 26 years ago, and brought it into our re-imagined brand to meet changing consumer needs. This resulted in a collection of simple yet effective products, which brings beauty back into the hands of the consumer. As part of the legacy of H2O+ Beauty, innovation will continue to be part of our ongoing plan in addressing consumers’ ever-changing needs. What are you working against when you’re rebranding? The challenge is how to retain our current loyal consumers while making changes in the rebranding to appeal to new consumers. We made the products better and more effective, and we also removed the no-good ingredients like phthalates, parabens, mineral oil. Additionally, we are also working to shift our distribution channels so they are consistent with the omni-channel shopper. For example, we are placing emphasis on establishing our website as our new flagship store and supporting it with other brick and mortar beauty retailers like Ulta. When rebranding you have to take a creative approach. But what are some creative approaches you’ve taken with leadership? We have studied and gotten inspiration from disruptive brands in categories outside of skincare and beauty to refine our rebranding. In addition to consumer feedback, we have incorporated feedback on our rebranding from industry experts including retailers, beauty editors, influencers, and agencies. 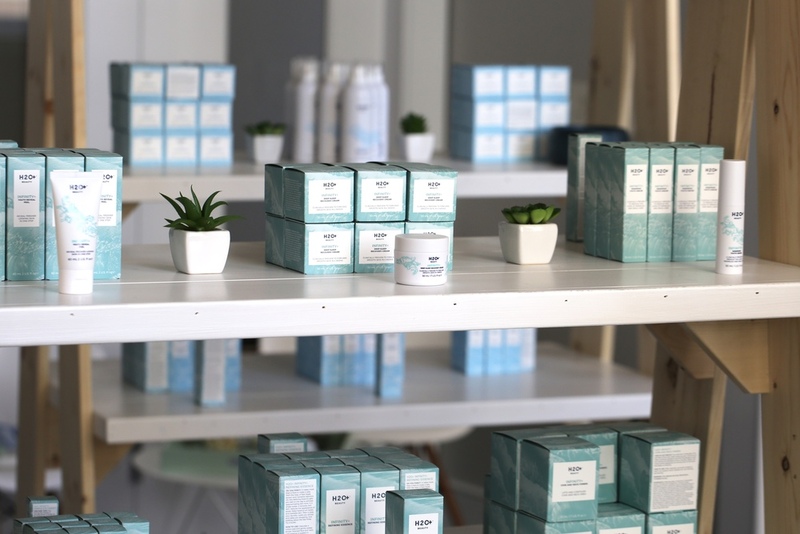 We found these creative approaches have shaped the reimagined H2O+ Beauty brand. What’s exciting about working with an older brand? vs. a brand like Yes to? H2O+ Beauty has a strong heritage and many have heard of it. It also has proven to be successful in the marketplace with its innovative products, particularly its Oasis Hydrating Treatment, the first of its kind featuring hydrogel technology. When we share the news of our rebranding with industry experts it’s even more exciting as they are familiar with the success and history of the brand. When is the right time to play it safe? On the flip side, you’ve talked about “punching above your weight class.” When is the right time to aim up? Always. My mentor has told me that danger lies not in setting your aim too high and falling short but in setting your aim too low and achieving the mark. It’s always important for a leader to aim high and lead the team to achieve the goal. "Danger lies in setting your aim too low and achieving the mark." 1) Be clear and consistent with what the brand stands for. 2) Respect your consumers as they are always right. 3) Strive for positive change that benefits the consumer, the team and the broader community.